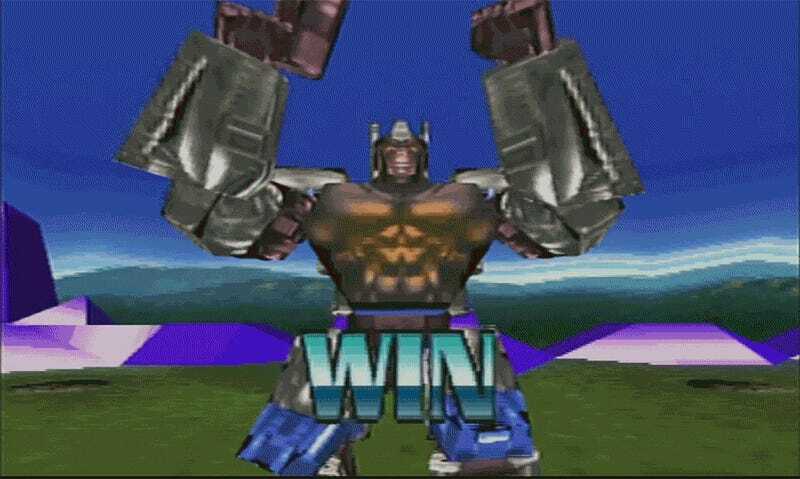 Beast Wars: Transmetals for the PlayStation. “Trukk not Munkey!” was the cry of fans as they rallied against Beast Wars when it debuted in 1996. 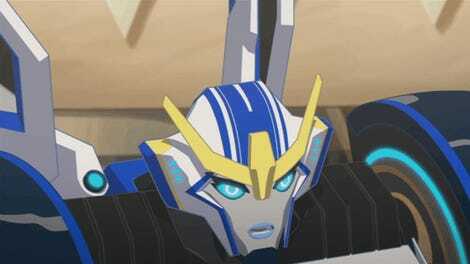 But over its three seasons of clever writing, original series easter eggs, excellent voice acting and one heroic sacrifice it became one of the most beloved animated series in Transformers history. It’s a pity its video games are such garbage. The Beast Wars animated series stars the Maximals and Predacons, descendants of the Autobots and Decepticons from a far-flung, semi-peaceful future. During a battle between a splinter-cell of Predacons led by Megatron and a Maximal exploration vessel commanded by Optimus Primal, a transwarp portal opens, sending the two groups millions of years into the past, where they crash land on a mysterious planet. When the surface proves so rich with energon (Transformer fuel) that it overloads the robots, sending them into stasis lock, their respective ships grant them animal forms that are immune to the effects of energon sickness. Once that’s over with, the Maximals and Predacons start fighting, because that’s what transforming robots do. The whole “having to stay in beast form to survive” thing is important, because it’s one of the main reasons the first video game based on the series, simply titled Beast War: Transformers, sucked so horribly. Developed by SCEE Cambridge, the Sony studio that changed its name to Guerrilla Ccambridge before being shuttered early last year, Beast Wars: Transformers is is a 3D third-person shooter released in 1997 for the PlayStation and ported to PC a year later. Players took on the role of a team of Maximals or Predacons (the first Transformers video game to let players pick sides), participating in a series of sabotage missions against the opposing faction. Beast Wars: Transformers. 1997 was not a great year for 3D. The first issue, which should be obvious, is the game is ugly as sin. 1997 was still early days for 3D graphics, and this being a licensed game meant that not a lot of time was going to be spent making things look pretty. The six playable characters on each side are recognizable, but only just. The main problem with the game, however, is that it’s a third-person shooter that limits shooting. Characters can only shoot in robot mode, but they can only stay in robot mode until their energon resistance meter drains, after which they have to revert to their animal forms. Thanks to YouTube’s 10 Min Gaming channel for playing this so I didn’t have to. Combined with vague mission objectives, bland environments and the fact that the characters are all voiced by sound-alikes (using the term incredibly loosely) instead of the show’s cast, Beast Wars: Transformers is a stinking pile. I’m not sure if the second Beast Wars game is better or worse. The game that started me down this path. Introduced in the second season of the animated series, Transmetals are Maximals and Predacons mutated by a quantum surge, turning them into brand new shiny toys for Hasbro to sell. Transmetal characters’ beasts modes looked more robotic, and their robot modes looked more bestial. They also gained a vehicle mode, because why not. Season two also introduced the Fuzors, robots that transformed into a combination of two animals, like Silverbolt, the heroic winged wolf. Beast Wars: Transmetals is a 3D free-roaming fighting game featuring Transmetals and Fuzors, released in 1999. Two versions of the game exist. The PlayStation version, developed by a studio called Wavedge, featured CG cutscenes with full voice acting. The Nintendo 64 version, developed jointly by Takara and Locomotive, lacks some of the movies and modes of the PlayStation version, but makes up for them with a couple of exclusive mini-games and ending scenes for all characters. Story mode lets players pick one of four characters on each side to fight in each battle. In story mode, players select a faction and participate in a number of pitched battles against their enemies. Each battle takes place on a portion of a map with the Maximal base on one end and the Predacon base on the other, with the goal being to reach the other side. It’s an ambitious game, with a lot of really cool ideas. Each battle stage features its own signature obstacles and hazards. Each character can swap between beast, robot and vehicle/travel mode, allowing for a variety of ways to take on opponents. The developers showed a lot of love for the characters—hell, they even got the cartoon voice actors this time around. It’s just that the implementation of all of these ideas is so poor. Stage obstacles strike at random with little reason. Vehicle mode looks neat but isn’t very useful. And while the characters look okay for the time, in motion they’re just so damn janky. Maybe if the developers had had more time or resources, Beast Wars: Transmetals could have been something special. Perhaps had they spent more time creating characters—there are eight fighters, plus four palette-swapped and re-skinned hidden robots—and less creating a 54-image gallery of toys for the extras section. There was one good Beast Wars game, but we never saw it in the states. Based off the Japanese Beast Wars II series, featuring traditional animation instead of CG, Kettō Transformers Beast Wars: Beast Senshi Saikyō Ketteisen is as good a fighting game as the Game Boy Color can manage. Unfortunately for North American fans, both Beast Wars games released in the west came out at a time when licensed games weren’t afforded the sort of care they are today. But perhaps there is still hope. With Beast Wars characters figuring big into this year’s Transformers: Power of the Primes toy line, maybe there’s still room for a good game about robots transforming into animals. Paws crossed.